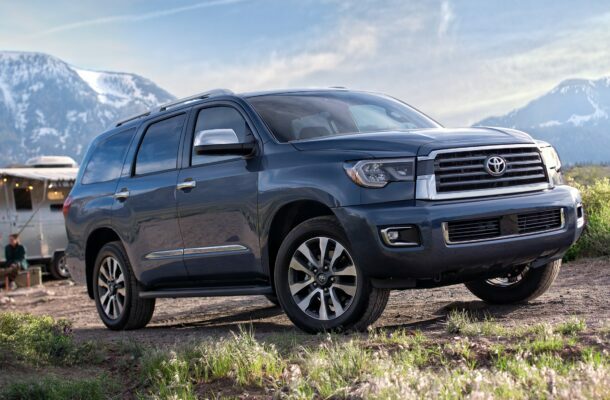 The 2019 Toyota Sequoia is a large SUV with three rows that’s rugged and reliable. The ride and seats are comfortable, but it’s not a crossover; it’s related to the Toyota Tundra pickup and has a more truck-like ride. The Sequoia hasn’t changed much in the last 12 years, although for 2019 the base SR5 model gets standard automatic emergency braking, while the top Platinum model gets perforated leather seats and an adaptive suspension that improves the overall dynamics. There are two other models, the TRD Sport and the Limited. Rivals include the Cadillac Escalade and Lincoln Navigator, although unlike those two, there is no Sequoia that offers extreme levels of luxury, not even the Platinum. So street rivals would include the Chevy Tahoe and Ford Explorer. The rear-wheel-drive Sequoia uses one engine, a 5.7-liter V-8 mated to a six-speed automatic transmission. It can tow up to 7,400 pounds when correctly equipped. Four-wheel drive is available, but, consistent with the rugged character of the vehicle, it’s a part-time system intended for off road. It’s not a modern electronic all-wheel-drive system like most SUVs. The fuel mileage is low, with an EPA-rated 13 mpg city, 17 highway, and 14 combined rating with four-wheel drive, or 15 mpg with rear-wheel drive. More powerful rivals like the Tahoe and Explorer get up to 18 mpg. The Sequoia has not been crash tested by the NHTSA or by the IIHS. It has all the right safety stuff: a rearview camera, blind-spot monitors with rear cross-traffic alerts, and for 2019, automatic emergency braking, as well as a tow/haul mode that reduces the burden on the brakes. Available are lane-departure warnings and automatic high-beam headlights. The 2019 Sequoia starts at about $50,000 for the SR5 and shoots up from there. We think the four-wheel-drive SR5, at about $53,000, is the best value. It includes 18-inch alloy wheels, LED headlights and daytime running lights, body-colored heated mirrors, sunroof, leather-wrapped steering wheel, power adjustable cloth seats, 4.2-inch display in the instrument cluster, three-zone climate control, and a 6.1-inch touchscreen for infotainment with satellite radio. It does not offer Android Auto or Apple CarPlay. The TRD Sport for about $56,500 adds 20-inch wheels, darkened exterior trim, a sport-tuned suspension with Bilstein shocks, captain’s chairs for the second row, and TRD logos in the cabin. The four-wheel-drive Limited at about $61,500 adds leather, power-folding third row, big shiny 20-inch wheels, chrome mirror caps and door handles, and a power tailgate. The Platinum, for nearly $70,000, adds the adaptive dampers with load-leveling suspension, cooled front seats, Blu-ray entertainment for rear passengers, and on the outside, unique 20-inch wheels, power folding mirrors with turn signal indicators, and even more chrome trim. If the Sequoia looks familiar, it should, after 12 years without a significant change to its styling. The shape is bulky; the proportions of the truck-based design include a short front overhang with long hood, seeming to stretch the distance between the front wheels and windshield. The last update brought tweaks to the front and rear fascia to bring sharper angles, along with more chrome. The Sequoia’s interior shows its age but it’s easy to use. The nearly vertical dashboard with rugged dials and knobs reminds you that it’s a truck. It’s comfortable, too, with front seats that are broad and well-padded, and have 8-way power adjustment for the driver’s seat, in the SR5. Cloth upholstery is standard on the SR5. It feels roomy though it provides less interior space than, say, the Toyota Sienna van. The frame doesn’t allow a low cargo floor or seats that fold into the floor. Of course it’s all a trade-off, as the van can’t tow like the Sequoia. Access to the third row isn’t easy. The best Sequoia for seating is the Platinum, with its power-folding third row and optional (meaning even more money) second-row captain’s chairs. The muscular V-8 engine makes 381 horsepower and 401 pound-feet of torque. It sounds great and moves the Sequoia with authority on the highway. The six-speed transmission shifts well enough, but it competes against the ten-speeds of some rivals, which partly explains the lower fuel mileage. The handling is truck-like, with lots of ride motion and relaxed steering. The TRD Sport package gets Bilstein shocks and bigger anti-roll bars that slightly firm up the handling. The four-wheel-drive system, with its low-range transfer case and a locking center differential, is not like the more street-oriented all-wheel-drive systems of rivals. It’s intended for off-road use, where the tires are allowed to slip to prevent binding in the drivetrain. The 2019 Toyota Sequoia doesn’t have the latest technology or the flair of other full-size SUVs—but the Toyota badge is good enough for those who recognize its value.